The Scandinavians believe that there is no such thing as bad weather-only bad clothing. They believe that daily exercise and fresh air, no matter what age, is beneficial. Unlike the thinking of most Americans, the Scandinavians believe that children should be allowed to have the freedom to roam and explore, and that leads to happy, healthy, and independent adults. 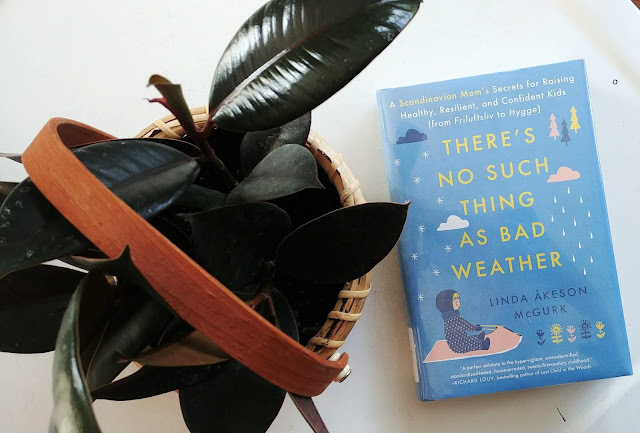 In this book Linda Akeson McGurk talks about her childhood of climbing trees, playing in mud puddles, and digging in the dirt and how she believes in outdoor play no matter what the weather. Inspired by her Swedish heritage she talks about how the concept of keeping children inside was so foreign to her, and her conversations with her children's teachers on that subject. Basically, the secret to raising independent, resilient, and confident kids is freedom to explore and enjoy daily fresh air, no matter what the weather is. Easy to read, and inspiring, you will never look at children and the weather the same way. That looks good! My daughter told me recently of being in a Bass Pro Shop with my oldest grandson when he bought a new fishing pole and gear with birthday money. The cashier commented on what a special young man he seemed to be (he just turned fifteen). My daughter told the cashier that fishing is his passion and he loves to be on the lake near their home whenever he can. The cashier said she rarely sees young people who love the outdoors like that, anymore. At a Bass Pro Shop! Although I can't say anything as my homeschooled son lived for computers (he is a Computer Scientist today, does that count as okay?). He did enjoy hiking when he wasn't at a keyboard. I agree with her, and this way of thinking. As a kid, I was always outside! We rode bikes, rollerskated, played on the swings, in the dirt etc...I've tried to raise my kids the same way. Its good for them and healthier than being inside all the time!